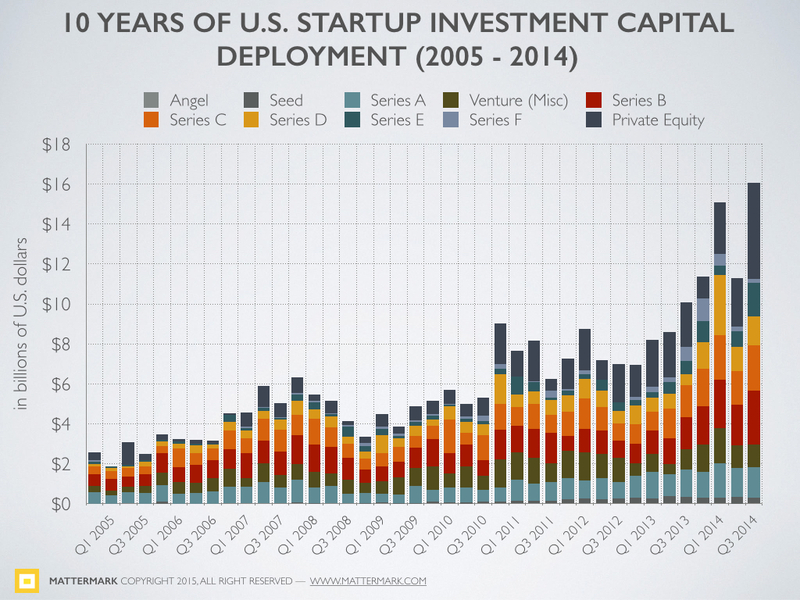 This analysis shares early results from “Startup Funding: Historical Analysis 2005 – 2014” and you can pre-order the full report for just $5 or pay-what-you-want. On February 2nd we will release the full report, including geographical, industry, and portfolio analysis. As the research and analysis process for this funding report continues, I find it fascinating to observe the concentration of capital around later stage deals. While discussion of deal volume and bubbly valuations at the early stage is a popular topic of conversation, it is the late stage mega-rounds that have been driving up total dollars invested into startups over the past 3 quarters. If you found this analysis interesting please consider pre-ordering the Startup Funding Report — it’s just $5 for the first 500 orders and the price will increase through the month until we release it at full price. This report includes only funding rounds in private companies in the United States. Additionally, it excludes funding in pharmaceuticals, biotechnology, energy and clean technology companies. Mattermark is an independent research platform used by the world’s leading private investors. We encourage you to perform your own research and analysis, and all the underlying data from this report can be accessed by Mattermark Professional subscription holders. Sign up to try free for 15 days.